This blog is now located at http://wxyong.blogspot.com/. Here's the walk rendered! Might use this clip for my showreel when I have enough content to update it :). Looking back at the previous 2 animations I've done with the Optimus rig made me realise how bad the animations were, haha. I really needed to do it more justice, so here's a new and improved walkcycle. Spent about 3 days on this (with the well needed polish time that the other animations didn't get). The main focus of this was to work out the body mechanics of a walk, especially on the hips as I feel it can make or break a walk with all the weight shifting going on. The secondary objective was to give it character, to make it unique and stand out as not just another robot. Thus the attempt to give him a slight limp/asymmetry in his movement. I just watched How to train your dragon in IMAX 3D with the animators from work and have to say I am very impressed. This movie is by far Dreamwork's best, not only are the character animation beautifully stunning but the story that holds it all together works for the most part fluidly. As with any story, there are a lot of areas where it can get too cliche and predictable, but I'm happy to say that this isn't the case here. I suspect the story guys at DW must have worked and re-worked this to get it this good. Character animation was one of the best, if not the best I've seen. 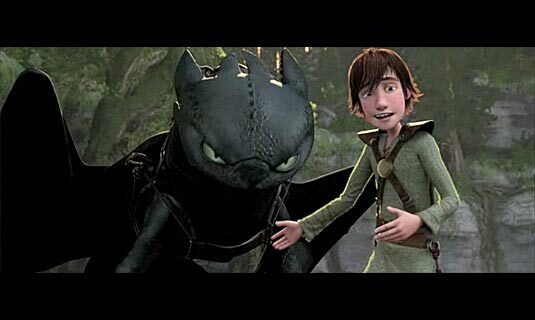 The best characters were Hiccup and his father; they felt so believable consistently throughout the movie. The acting and performance was incredible to say the least. Really excellent work. Special effects were really great too as is the music. Overall, everything holds together very well in this solid piece of animation that is both moving and a thoroughly enjoyable experience. It usually takes a few days or sometimes even weeks until you can view your own animations with a pair of "fresh eyes". What I'd like to do from now on is to review my animations and write notes on it. Ok! So let's review my most recent transform animation. -Transform sequence needs to be faster. -More than one body part can be animated at any one time to create a better sense of gizmo movement. -An overall body thrust/movement can help drive the motion of the entire animation (such as a jump). It comes down to the same principle that everything starts from the hips. -Moving holds could be better with some polish time. -Jump motion feels a little floaty, need to watch the spacing more carefully. -Relaxed arm could use a little more polish. If there is anything else I've missed out, please feel free to comment! This one took me more or less 2 days and was great fun to do! It's one of those "impulse" animations where I just go with the flow and animate straight ahead. Part of the reason would be because I don't even know how to set a KEY-ALL button on the character set in Maya to even attempt the pose-to-pose method. © 2009, Wei Xing Yong. All rights reserved.